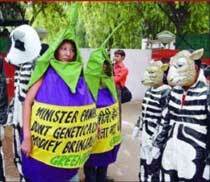 Giving in to intense opposition from NGOs and several states, the government on Tuesday put on hold commercial cultivation of genetically modified brinjal citing lack of clear consensus within the scientific community. Environment Minister Jairam Ramesh announced the decision to put a moratorium on the release of Bt brinjal till such time independent scientific studies establish, to the satisfaction of both the public and professionals, the safety of the product from long-term view on impact on human health. "A moratorium implies rejection of this particular case of release for the time being; it does not, in any way, mean conditional acceptance," he said. "I am not getting into any timeframe . . . the moratorium will continue for as long as it is needed to establish public trust and confidence," he said. Ramesh made it clear that the moratorium was only confined to Bt brinjal and the decision did not cover the larger issue of genetic engineering and biotechnology in agriculture. The decision was arrived at after month-long public consultations by the minister in seven cities across the country, that often turned acrimonious. A number of state governments, including Congress-ruled Andhra Pradesh, have publicly opposed the introduction of Bt brinjal. Ramesh also discussed the issue with several eminent scientists, including M S Swaminathan. Biotech regulator the Genetic Engineering Approval Committee (GEAC) had in October last year recommended going ahead with commercial cultivation of Bt brinjal but left a final decision to the minister. There was uproar from several quarters, including leading scientists and civil society groups, over the GEAC suggestions following which Ramesh decided to hold public consultations. Questions were also raised on the integrity of the members of the GEAC as one third of the members of the Expert Committee-II (EC-II), who were also part of previous such panel, chose to discard the need for any further studies. Leading scientist P M Bhargava had claimed that the Chairman of EC-II had agreed with his assessment that eight essential tests had not been conducted by Mahyco. Noting that the current standards of the GEAC in formulation of the decision on Bt brinjal did not match with the global regulatory norms, Ramesh said: "GEAC processes need to be changed and made more transparent." Ramesh noted that a National Biotechnology Regulatory Authority has been on the anvil for six years and the moratorium period should be used to operationalise the body in its entirety as being recommended by many scientists and civil society groups. The decision should not be construed as discouraging on-going R&D in using tools of modern biotechnology for crop improvement as issues of this kind need to be examined and decided on a case-by-case basis, he said. Ramesh pointed out that import of GM products, without proper labelling, was illegal and attracted penal action under the Foreign Trade (Development and Regulation) Act, 1992. He said in arriving at his decision, he has responded both to science and society and had followed Prime Minister Manmohan Singh's speech in the Indian Science Congress last month. "I have followed democratic, transparent and often acrimonious process. I have put my decision before people. I have given the reasons for my decision. My conscience is clear," he said. The environment minister said he wanted the issue to be discussed in Parliament and National Development Council in detail. The minister said the moratorium was to the version of Bt brinjal developed by Mahyco, in which Monsanto has 26 per cent stake. The Tamil Nadu Agricultural University, Coimbatore, the University of Agriculture in Dharwad (Karnataka) and two laboratories of the Indian Council of Agricultural Research are also developing genetically modified versions of brinjal. Asked about the possibility of spurious Bt brinjal seeds making their way into India, Ramesh said it was up to state governments to check this. "I hope we don't see a repeat of Bt cotton where spurious and illegal Bt cotton seeds found their way into the market." The agriculture and science & technology ministries had supported the commercial release of Bt brinjal. Asked to comment on Agriculture Minister Sharad Pawar's support the cultivation of Bt brinjal, Ramesh made it clear that his ministry was the competent authority to take a call on the issue. "GEAC has been created under the Environment Protection Act, it is located in the ministry of environment and forests. It referred the matter on Bt brinjal to me and as minister concerned it is natural for me to take a decision," he said. To a question, he said since he assumed the charge of Environment portfolio on May 29 last year, he had not met representative of any company involved in genetically modified crops though as commerce minister he had met them. Bt brinjal is a genetically modified vegetable which is infused with Cry1Ac gene from a bacterium Bacillus thuringiensis to make the plant resistant to the fruit and shoot borers and certain pests. Some scientists have been opposing it, arguing that the genes were toxic and would affect the health of the consumers. The GEAC announced approval for large scale field trials for Bt brinjal in September 2007 with the possibility of commercialisation by 2009. It also cleared proposals for biosafety studies for other food crops such as ladyfinger, rice, and tomatoes. In February 2008, the Supreme Court revoked its earlier ban on the approval of large scale field trials of transgenic crops. Mahyco-Monsanto Biotech, the company involved in genetically modified foods, has been arguing that a normal farmer sprays pesticide at least 50 to 80 times in the entire life cycle of a brinjal crop, and these toxins are transferred to the consumers. Bt brinjal, on the other hand, affects only the pests and not the humans, it has been maintaining. Gene Campaign, an NGO opposed to Bt brinjal, has been contending that Bt gene produces poison and "when it can harm pests, where's the proof that it won't be harmful to humans?" NGO Centre for Science and Environment (CSE) backed Ramesh on his decision to put a moratorium on the commercial cultivation of Bt brinjal. "We are not against the use of genetically modified technology to improve crop yields. But we definitely oppose the introduction of Bt brinjal," Sunita Narain, Director, CSE said. "We believe India needs stringent system of testing, regulating and labelling all genetically modified foods before these can be introduced here. It is a question of public health which cannot be compromised at any cost," said Kushal Yadav, head of CSE's food safety and toxins unit.